The MatchMiner project links patients with clinical trials of targeted therapies. 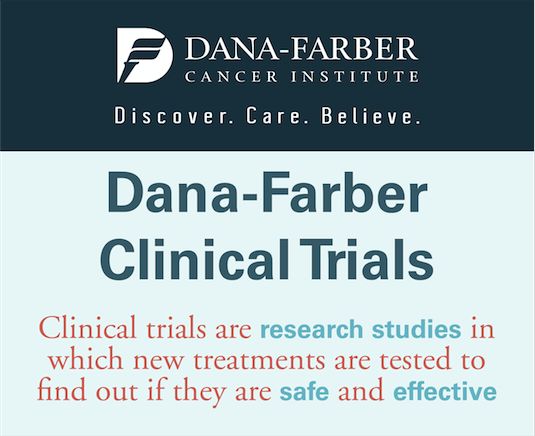 Clinical trials are research studies that explore whether new treatments, diagnostic techniques, or disease-prevention strategies are safe and effective in patients. They may be an option when patients no longer benefit from standard therapies. They may also offer an alternative to standard therapies, particularly if the agent being tested is likely to be more effective and/or cause fewer side effects than conventional treatments. Trials usually have strict patient eligibility requirements. These specify not only the type of cancer being treated but also its stage, the age range and health characteristics of participating patients, whether the cancer has already been treated, whether the cancer carries certain genetic and cellular features, and a variety of other criteria. Most trials also have a list of exclusions – criteria that would disqualify patients from enrolling. It can be challenging to sort through this information to determine which trials you may be eligible for. The National Institutes of Health maintains a registry of all open trials in the United States. 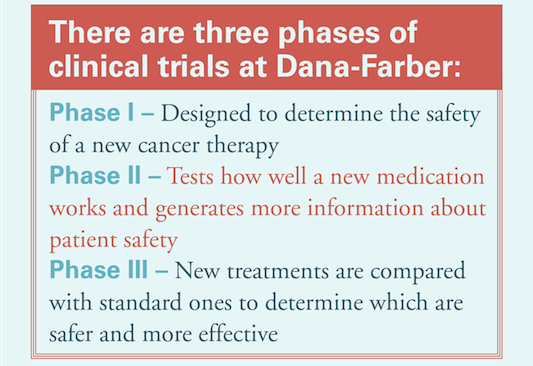 Most major cancer centers, including Dana-Farber, provide an online listing of trials available on-site. Traditionally, it has been up to patients to navigate this information themselves, but several sources of guidance are available. Advocacy groups such as the Leukemia & Lymphoma Society and the American Cancer Society have services that assist patients through cancer treatment. Many of these organizations also host online discussions to share information about clinical trials. Some patients hire patient advocates, also known as patient navigators, to guide them through the health-care system and, if necessary, help identify appropriate clinical trials. 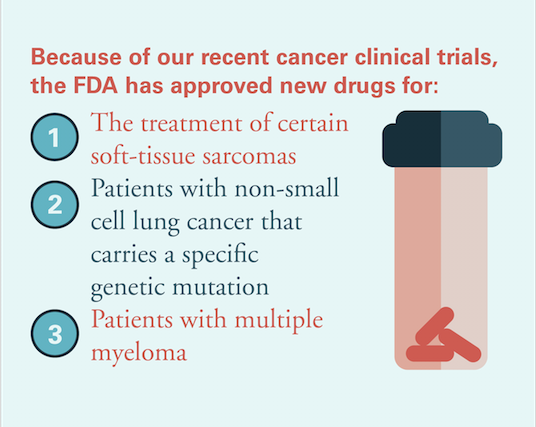 At most major cancer centers, oncologists themselves can often direct patients to specific clinical trials open at that site or nearby institutions, according to Bruce Johnson, MD, Dana-Farber’s chief clinical research officer. At Dana-Farber, a new computer program called Match Miner enables physicians to quickly link patients with clinical trials based on the set of genetic mutations in patients’ tumor cells. 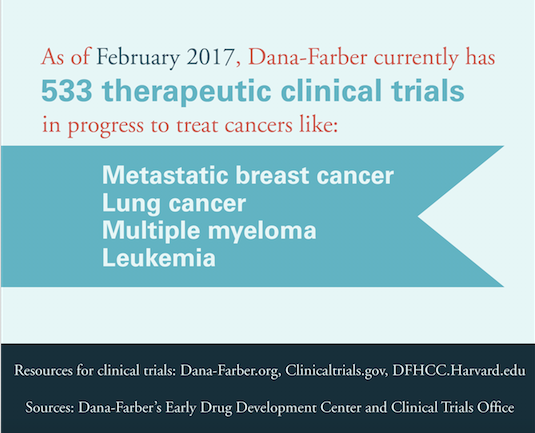 The program, which launched in 2016, will soon be expanded so patients themselves can identify such trials. 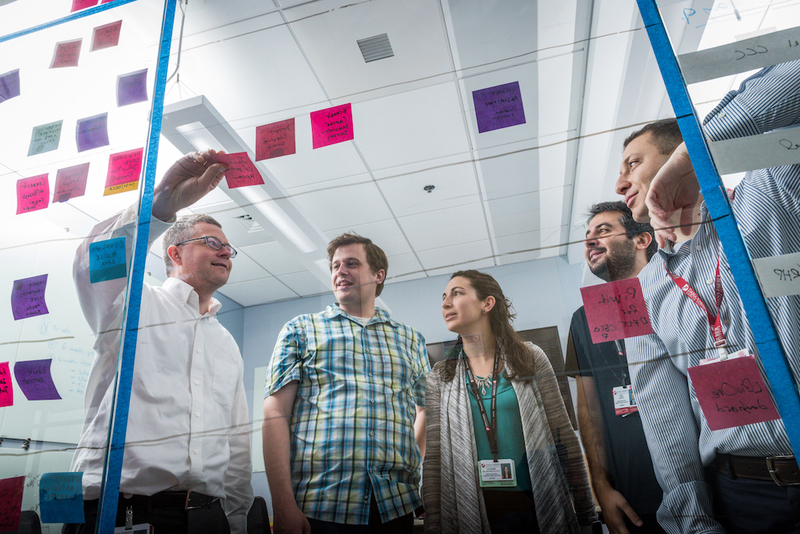 Ultimately, the program’s developers hope to make it fully open source and available to patients and clinical trial leaders at other institutions. 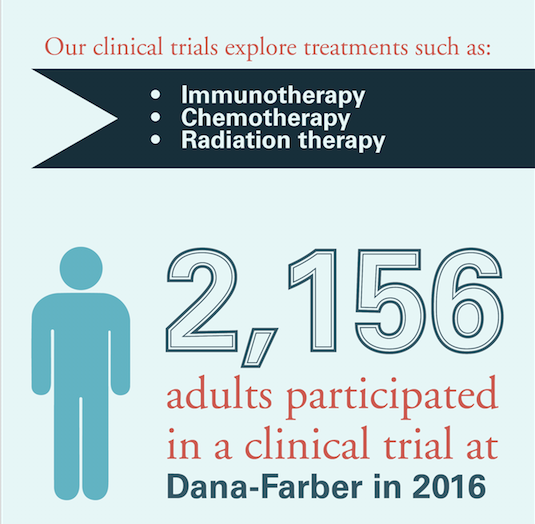 View the infographic below for information on clinical trials at Dana-Farber (updated March 2017).